Photo from Tug of War by Dr. Gerd Heuschmann and used by permission from Trafalgar Square Books. When canvasing equestrian-related social media, it appears that draw-reins are quite fashionable again. 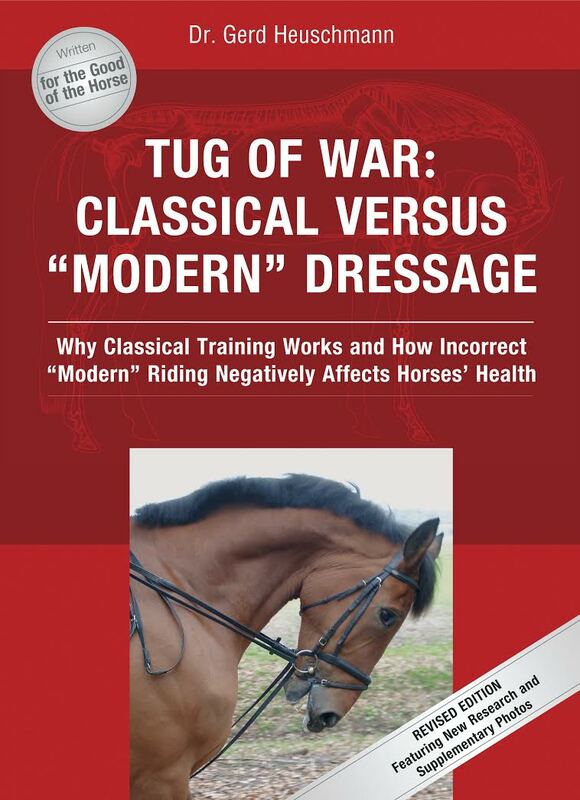 And every “like” says “regression” rather than “retro.” After all, it has been 9 years since the publication of the controversial book Tug of War, by Dr. Gerd Heuschmann, confronted modern horse training and riding methods (specifically in dressage and including draw-reins), claiming they are often both incorrect and inhumane. Dr. Heuschmann insists on the slow development of the horse via classical training methodology and calls out the trends of hyperflexion, tight nosebands, and draw-reins as damaging to the body and psyche of the horse. Hyperflexion in the neck, commonly known as the Rollkur method. Photo from Tug of War by Dr. Gerd Heuschmann and used by permission from Trafalgar Square Books. It seems that much attention has been paid to the subject of hyperflexion in the past decade, and a new scientific study names crank nosebands as a leading cause of elevated stress levels in performance horses. 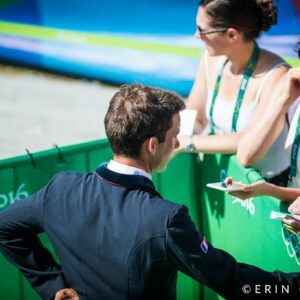 So what about those draw-reins? 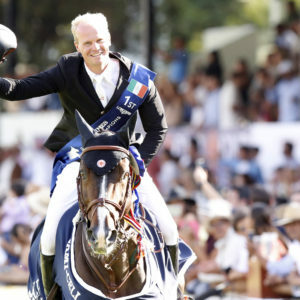 Here are 6 Key Points from Dr. Heuschmann’s book, explaining our roles and responsibilities when it comes to training and riding our partner in sport and in life—the horse. Key Point #1: Contact in the classical sense becomes possible only if the horse lets its movements flow through its supple body, thereby eventually “seeking” the connection to the bit by itself. The bit is carried by the relaxed jaw muscles on the bars of the horse’s mouth. 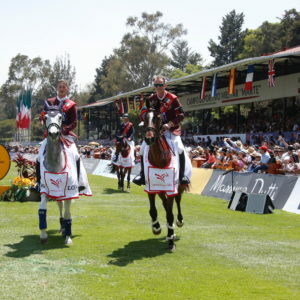 Key Point #2: It is crucial to note that this connection is not formed by tying the horse’s mouth shut with a tight noseband. Correct contact can only be achieved with an active mouth; the mandibular joint must be able to move. Nosebands of any type must not be adjusted too tightly, without exception. The jaw must remain mobile and breathing unimpeded; otherwise, tension will build that transfers to the entire body. Riding with hands that are too hard, and continuously influencing the horse with overly strong rein aids have a negative effect on the horse’s entire body. 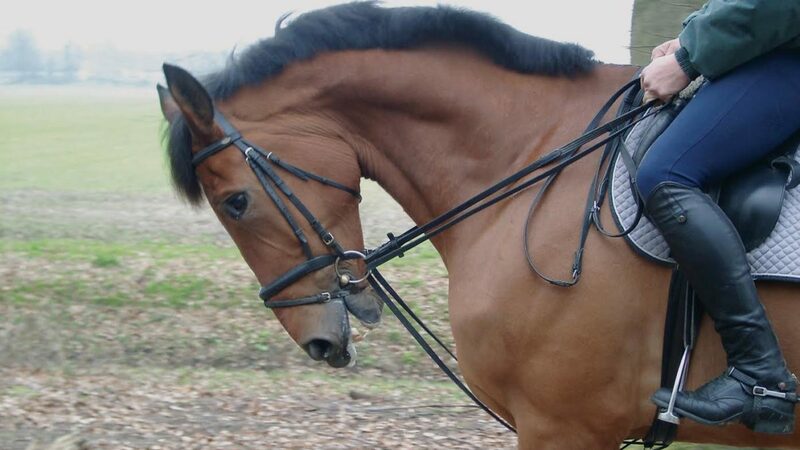 Key Point #3: In my opinion, you should try to use a soft, well-fitted snaffle bit (single- or double-jointed) during a horse’s entire course of training. The anatomy of the lower jaw, unique to each horse, determines the choice of the bit. The purpose of using a sharper bit should only be to refine the aids. It should never become a means of coercion to control the horse or to force it into a certain headset. 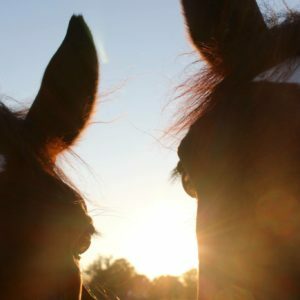 Key Point #4: In a live horse, the area around the throatlatch appears to be a robust, massive connection between the head and the neck. When looking at a skeleton, however, you can see that the only boney connection of the skull to the cervical spine is located quite high up with the rest of the head and neck, including the first few neck vertebrae, only connected through soft tissue parts. Photo from Tug of War by Dr. Gerd Heuschmann. Used by permission from Trafalgar Square Books. The boney anatomy of this area explains why a backward-acting rein creates a big lever action: viewed from the side, the poll can be considered a pivot point for the skull. If a horse wants to lift its head—i.e. 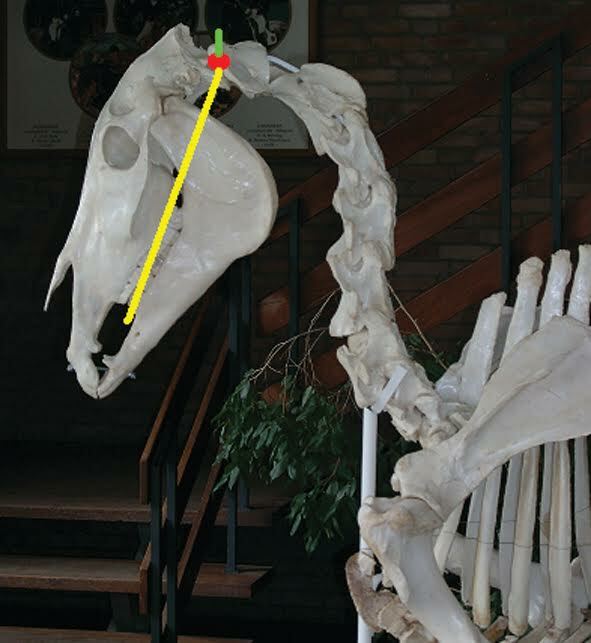 stretch its poll—while its neck remains fixed, there has to be a muscle pull on the occipital bone (see photo, in red). This action is executed by the muscles Mm. recti capitis dorsales (major and minor) and M. semispinalis capitis as well as the M. splenius capitis. Their “lever arms” are very short (about 1.6 to 2.4 inches, see green line in photo). The length of the lever that the rider has available for his rein influence extends from the poll to the bars of the mouth (see yellow line in photo). A pull on the reins in order to bend the neck acts on the bars of the mouth. The connecting line between poll and bars is between 11.8 to 15.7 inches (depending on the length of the horse’s head). This creates a lever ratio of approximately 1:7 to 1:10. To simplify matters, calculating with 1:10 yields 66 pounds of force (lbf) on each rein, which creates a pull of 132 lbf on each bar of the mouth. If the mouth of the horse doesn’t yield to this pressure, a force of up to 1,323 lbf occurs at the occipital bone—approximately 10 times the amount acting on the bars! Now, how can a horse’s back swing if it has been fixed by hundreds of pounds of pulling action via the back’s ligament and muscle system, as explained to you earlier? 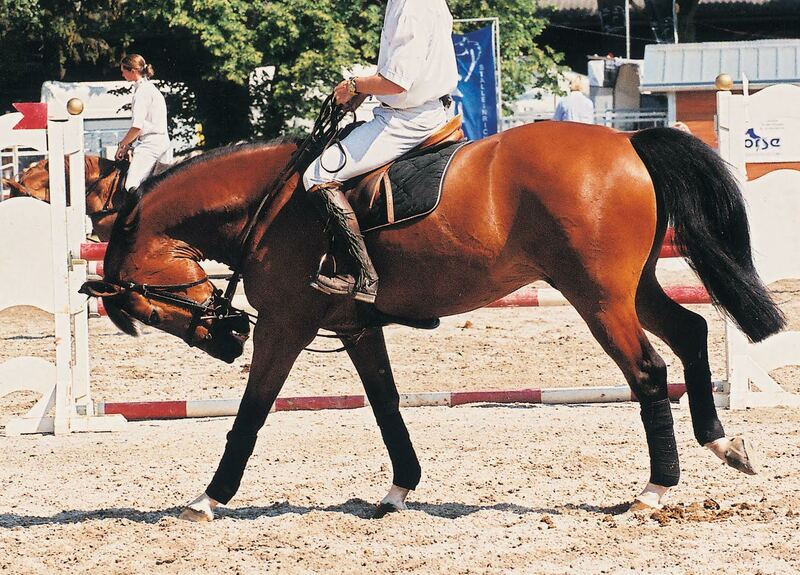 How can this horse possibly allow its rider to sit comfortably with such tension? And how can its back—and legs—remain healthy? Key Point #5: For this reason, the Classical Principles of riding a horse from back to front, toward the rider’s hand, is a vital one if you want to maintain a healthy and sound riding horse! The correct set of the head and neck, which depends on the horse’s age and experience is achieved automatically with correct contact. The opposite system—riding a horse from front to back—inevitably leads to faults in movement and impairs the horse’s musculoskeletal health. A good rider must use his aids like a sharp knife—cautiously and gingerly! Key Point #6: I’d like to emphasize that every attempt to mechanically put the horse’s head and neck into a specific set frame using one’s hands is the beginning of the end, and has far-reaching training consequences. Draw-reins multiply the force effect the bit has on the bars, and fundamentally act to pull the head and neck in a backward direction. It’s a mystery to me how a rider can tolerate such a devices in a horse’s training, and even accept its use at shows. Many problems, such as poor rideability, resistance, and hind leg lameness, to name only a few, are often the result of tension-laden “backward riding” and the use of draw-reins. This excerpt from Tug of War by Dr. Gerd Heuschmann is reprinted by permission from Trafalgar Square Books.